Coma is a state of unconsciousness from which a person cannot be roused. A person in the coma state is neither awake nor aware. He’s alive but incapable of responding to stimuli. You may be able to wake a sleeping person up by shaking them or talking loudly but this won’t work for a person who's in a coma. People usually slip into a coma when they experience a severe head injury that may cause the brain to move back and forth in the skull, thereby tearing blood vessels and nerve fibers. This tearing causes the brain tissue to swell which presses down on blood vessels, blocking the flow of blood (and hence, oxygen) to the brain. It’s this lack of oxygen supply to the brain that damages the brain tissues and results in a loss of consciousness that manifests as a coma. Coma may also be caused by other conditions such as aneurysm and ischemic stroke, which also block oxygen supply to the brain. Encephalitis, meningitis, low and high blood sugar levels can also lead to coma. 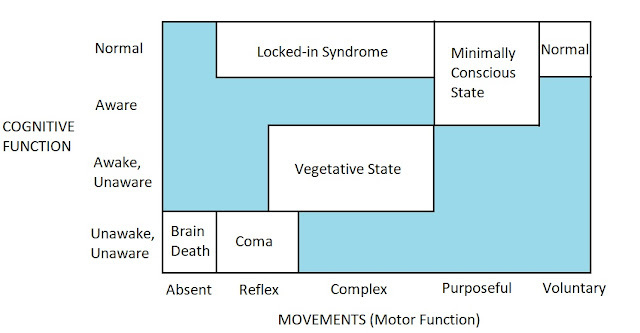 How deep a person falls into the coma state depends on the severity of the injury or illness. Coma belongs to a family of disorders called disorders of consciousness that represent different degrees of unconsciousness. To understand these types of unconsciousness states let’s say Jack suffered a head injury during an accident. If Jack’s brain completely ceases to function, doctors say that he’s brain dead. It means he has permanently lost consciousness and the ability to breathe. If Jack slips into a coma, the brain doesn't shut down fully but works at a minimal level. He may or may not be capable of breathing but he can’t respond to any stimuli (such as pain or sound). He cannot perform any voluntary actions. His eyes remain closed and there’s a lack of sleep-wake cycle in the coma state. Say, after a few weeks of staying in the coma, Jack shows signs of recovery. He’s now able to open his eyes, blink, sleep, wake, and yawn. He may also be able to move his limbs, grimace, and make chewing movements whilst still being incapable of responding to stimuli. This state is known as the vegetative state. Instead of slipping into the vegetative state, Jack may slip into what is known as the minimally conscious state. In this state, Jack can show non-reflexive and purposeful behaviors but is unable to communicate. He is intermittently aware. A coma usually lasts for only a few weeks and a person is able to recover gradually, transitioning from unconsciousness to consciousness. Brain stimulation via therapy and exercises can aid the process of recovery. The longer a person stays in a coma, the less the chances of recovery but there exist cases of people recovering from coma even after 10 years and 19 years. Why do people go into comas? A safety fuse in an electronic appliance melts and breaks the circuit if too much current passes through the circuit. This way the appliance and the circuit are protected from damage. 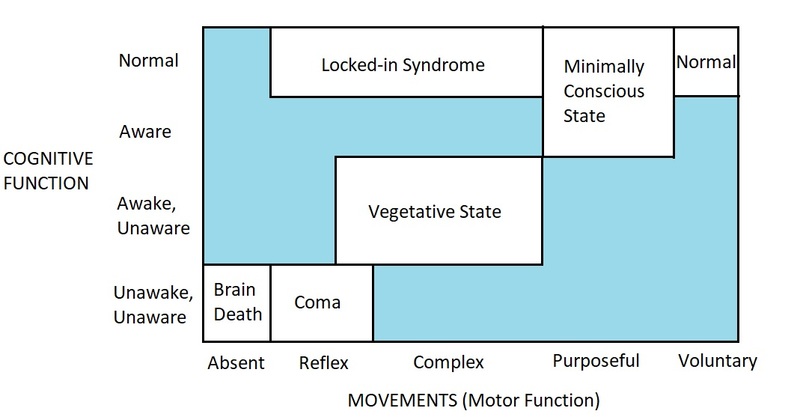 Injury-induced coma works in pretty much the same way, except that the brain isn’t entirely shut down (as in brain death) but operates at a minimal level. In this sense, coma is very similar to threat-induced fainting. While fainting is a response to a potential threat, coma is a response to an actual threat. While fainting prevents you from being injured, coma is your mind’s last attempt to save you when you’re actually injured. 1. Mikolajewska, E., & Mikolajewski, D. (2012). Consciousness disorders as the possible effect of brainstem activity failure-Computational approach. Journal of Health Sciences, 2(2), 007-018. 2. Brown, E. N., Lydic, R., & Schiff, N. D. (2010). General anesthesia, sleep, and coma. New England Journal of Medicine, 363(27), 2638-2650. 4. Buss, D. (2015). Evolutionary psychology: The new science of the mind. Psychology Press.